Here is some Polynesian work that I’ve done lately as well as some other pieces. The goddess of the wind, La’amaomao is holding the ipu (calabash) of the 32 winds of Hawaii. The god Lono, is standing on her legs and is seen behind her. Lono is both the ipu and the winds itself, being the god of fertility and wind, among other things. Honu is mainly asthetic with some protection thrown in for good measure. Shoulder cap of strength and growth imagery that is done to represent the talon of a raptor. 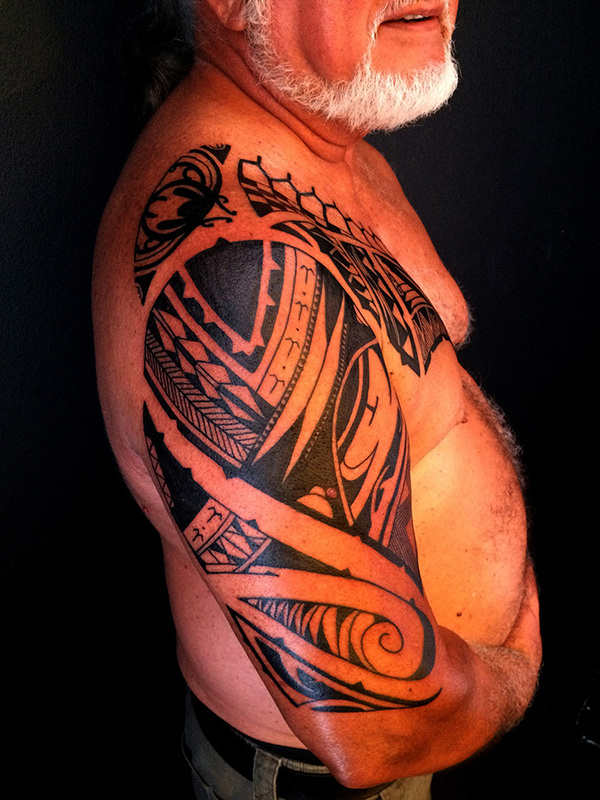 Shoulder cap, done Ta Moko style (Maori) with taulima influences. This shows his love of family, strength and courage as well as his love of Hawaii. Ta Moko style upper calf band meant to protect from harm and to look out for danger. 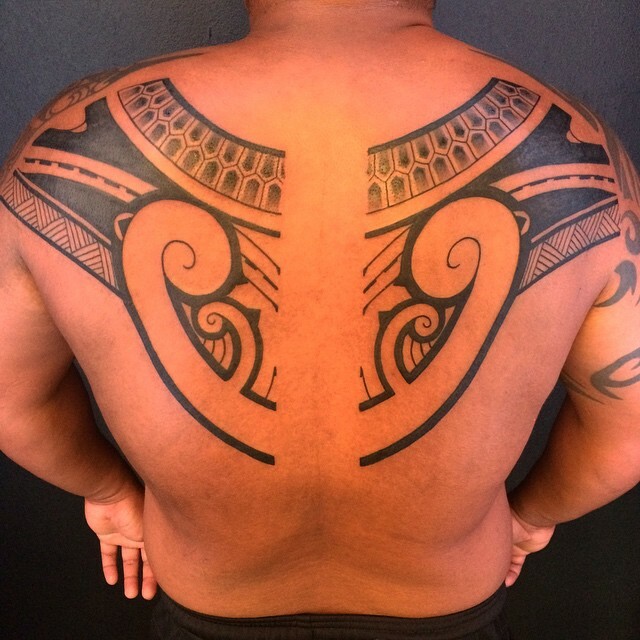 Side piece donw in modern Marquesan with Ta Moko influences. This piece is represents her travel, ancestors, family and growth. Modern Marquesan, freehand. This is all about power and retaining mana. Father and son matching Ku tattoo’s. I tattooed the father a few years ago and so he wanted his son to have the same. Modern Marquesan chest piece, cover up. Olive tree branch. In memory of his daughter, Olive. She passed shortly after being born. Modern Marquesan and Ta Moko, gauntlet. ‘Iwa lani, love of Hawaii and the ocean, his family and protection. This week has been all about chest plates! Two consecutive clients, completely unrelated and unknown to one another chose to get chest plates (and a shoulder piece) to chronicle their lives and loved ones. I’m very happy with the results and am now so exhausted that all I can do is stare off into space as I contemplate going back to work next week, lol. Here are the breakdowns of each piece. j) mata tomoe = Death’s head: this is the unicorn of Polynesian tattoo as it was initially seen on the Langsdorff voyage to the Marquesas in the early 1800’s. It was chronicled by an illustration drawn on that voyage but the image was never seen again in future expeditions and any forthcoming information regarding it was ever given. I have re-imagined it, and designed it to be skull-like in appearance. It is said to represent death but also protection from death and acceptance of death, as well. I did this chest piece a few months back and have been so busy lately that I’m finally getting around to posting the breakdown. He wanted to incorporate the old tattoo (I did not do) into the new piece. When he comes back I will fix the color in it. Anyway, this chest plate is meant to signify his love for his birthplace as well as to commemorate his new journey in life, moving forward. I really enjoy how this all came together and can’t wait to give it another pass when he comes home to visit. I did this piece over the course of two days last week and had a blast! 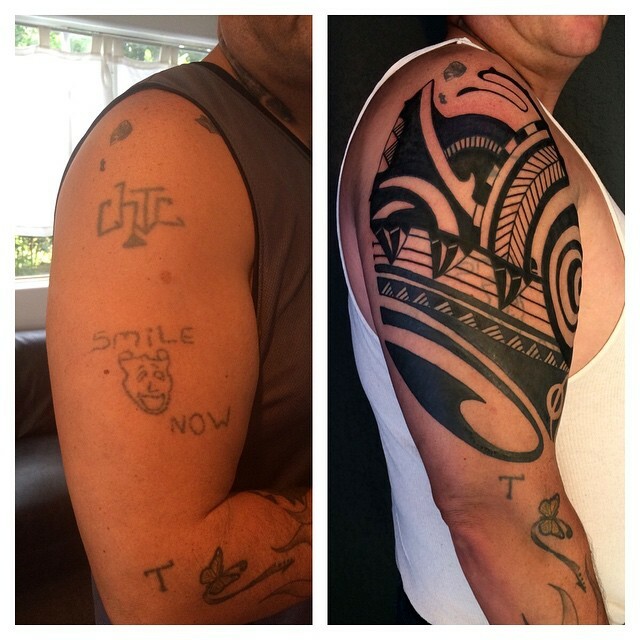 The client was a gentleman from Hilo who was looking for something to speak of his time in the military, his ties to his ancestors and also to show familial ties. It was also important that the tattoo incorporate protection as well as warrior motifs. He came to me already having researched his family name and discovered that he had an ancestor that was a kumu lua (teacher in the art of Hawaiian hand to hand combat) who had taught skills to ali’i on Kauai during the time of Kamehameha I. He was also a pilot in the Vietnam war and also flew search and rescue with the fire department here in West Hawaii and also created the protocols for the now defunct marijuana eradication program, Green Harvest. He wanted to tell his story of a warrior, of being descended from warriors and also to pay homage to his family. This piece was an awesome undertaking as I tried to combine all of these elements to create a cohesive piece. I had a blast working with the client and enjoyed immensely they time we spent over the two days that it took to complete. a) maka [eye], this paka contains an eye; one looking forward, the other looking backward to protect from harm in either direction. b) koru [unfurling fern head], symbolizing growth, life, breath, this gives intention to the piece behind it ‘c’. c) na niho [teeth], there are 3 large niho, followed by 3 sets of 3 niho, the larger represent his 3 daughters and each set of 3 represent their respective children. d) unahi [fish scales] love of the sea and for swiftness. e) manu [bird] this theme is repeated throughout the piece and is a reference to his time as an airplane/helicopter pilot. f) pepehipu [hammered tapa cloth] this is an armor analog for protection, it is inset with a row of niho at the end that is meant to protect the tattoo from harm. g) ama kopeka/ahi [fire] this keeps bad spirits away and also acts to illuminate the path of the symbol behind it ‘i’. h) pili niho [joined teeth] two joined teeth representing the union of him and his wife. i) manu [bird] this theme is repeated throughout the piece and is a reference to his time as an airplane/helicopter pilot. j) lei niho [garland of teeth] there are 2 rows, top and bottom, of teeth, each representing a year of marriage, 50 total, plus one to symbolize many more to come. k) manu [bird] this theme is repeated throughout the piece and is a reference to his time as an airplane/helicopter pilot. l) hoka [rays of the sun, rafter motif] this sort of symbol was one of many found carved or painted upon the rafter of a home or dwelling, it represents courage. m) malu [protection] overlapping diamond shapes are meant to protect as armor. n) lei-o-mano [string of shark teeth] this club-like weapon was used in hand to hand combat and in this instance is used to indicate his ancestral ties with a kumu lua that taught fighting techniques to ali’i on Kauai during the era of Kamehameha I.
o) ikeike [cyclophyllum barbatum] this hearty flowering shrub of the coffee family was known for its resistance, fortitude and toughness, its wood was also used to make weapons and tools. p) a’aka hala/lauhala [Pandanus weave] this symbolizes the woven fronds of the hala tree and symbolizes family unity and armor. q) la’au [club] this symbol represents a club used for combat and is a reference to part of his family name and ancestral past as kumu lua. r) maka [eye], this paka contains an eye; one looking forward, the other looking backward to protect from harm in either direction. 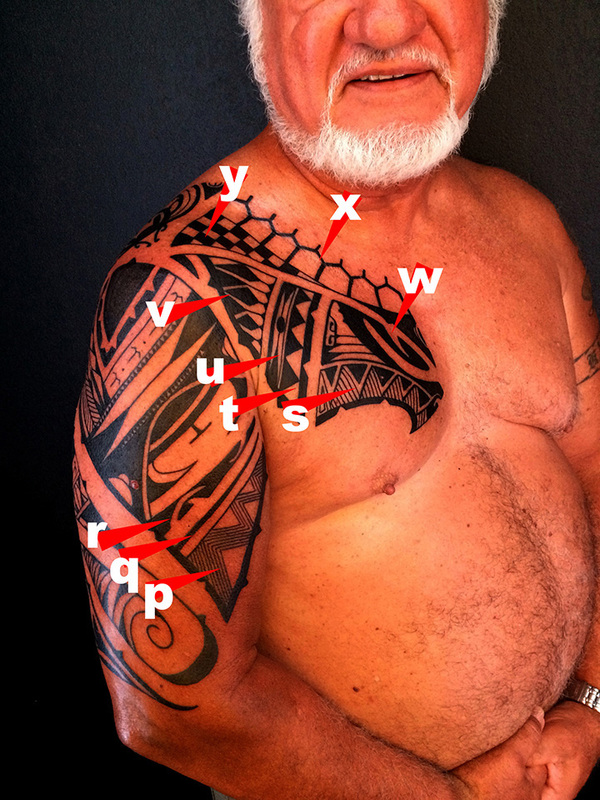 symbols s,t,u,v,w are considered as one image, and that is the Spirit of War (SoW), which is a direct analog to his ancestor that was a kumu lua. It forms a head in profile, of the SoW. s) pahiko a tuivi [fish net] this symbol makes up the mouth of the SoW and is intended to catch sin or protect from sin. t) niho mano [shark teeth] this represents the first of his ‘aumakua, the shark, and makes up the part of the head portion of SoW. u) naheka kai [sea snake] this represents his second aumakua, the sea snake, the triangle and two dots represent the pattern on the snake’s skin. v) hulu pu’eo [owl feathers] this is his third aumakua, the owl. w) mata hoata [all seeing eye] this makes pup the face of the Sow, it also has an ama kopeka, or flame on the top of its head. x) ani ata [sky, heavens] this represents his ancestors as well as heaven and the horizon. y) a’aka hala/lauhala [Pandanus weave] this symbolizes the woven fronds of the hala tree and symbolizes family unity and armor. Just wanted to post the progress shot of a full back piece in progress. This pic was taken on the second day of work, as I broke the piece into halves. The left side was done on day one; the right completed the next day. This piece will also incorporate taulima Samoan elements in the final lower stages, the upper portion maintaining Maori and Marquesan motifs. When it is completed (by July) I will post the breakdown. 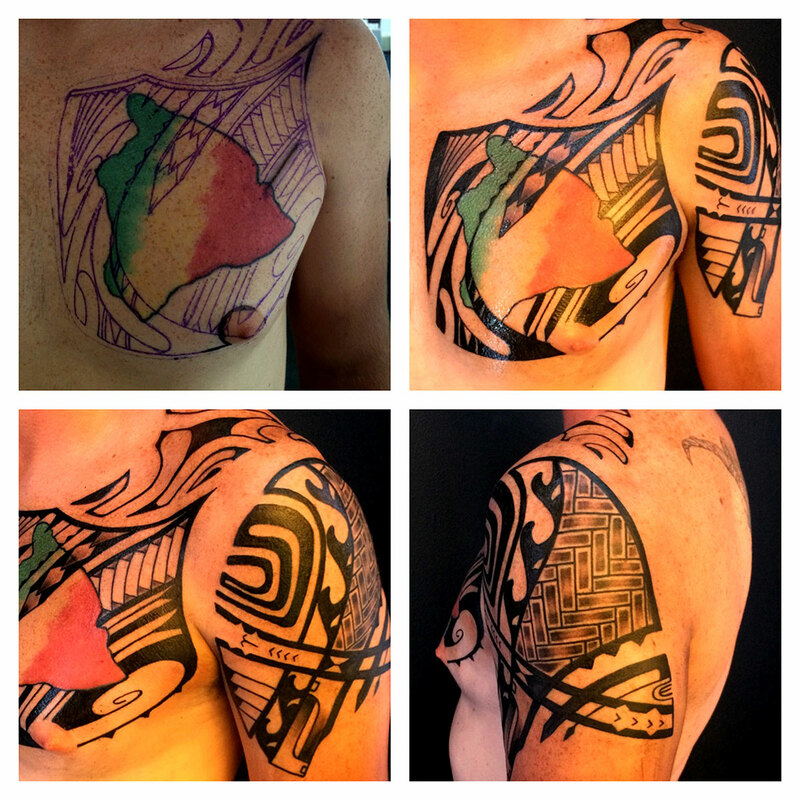 This cover up is a combination of Maori and Marquesan motifs that roughly follows a Taulima (Samoan) structure. It does not cover his old gang tattoos completely as I felt that by leaving some of the old tattoo poking through, it could serve as a reminder of sorts, of his past, so that moving forward he could have a reminder so as not to stray from the path of righteousness. The intent of this tattoo was more aesthetic but it does have a lot of personal meaning to him as well. Growth, protection and strength form the basis for this piece. a) Koru: unfurling fern head, Maori- Life, breath, new beginnings, growth and connection to the earth. b) Ama kopeka: fire, Marquesan- To illuminate, to cast light upon. Used here to light his path moving forward. c) Koniho: teeth marks, Marquesan- To protect from evil. d) Ipu ao: bowl of the earth, Marquesan- Container of mana/power, creation, life, light. e) Unaunahi: fish scales, Maori- Abundance. bounty of the sea. Here used to represent Hawaii and aloha. f) Mata: eye, Marquesan- To watch over, protect. g) Niho: teeth, Marquesan- Used to protect the tattoo and the wearer from harm. 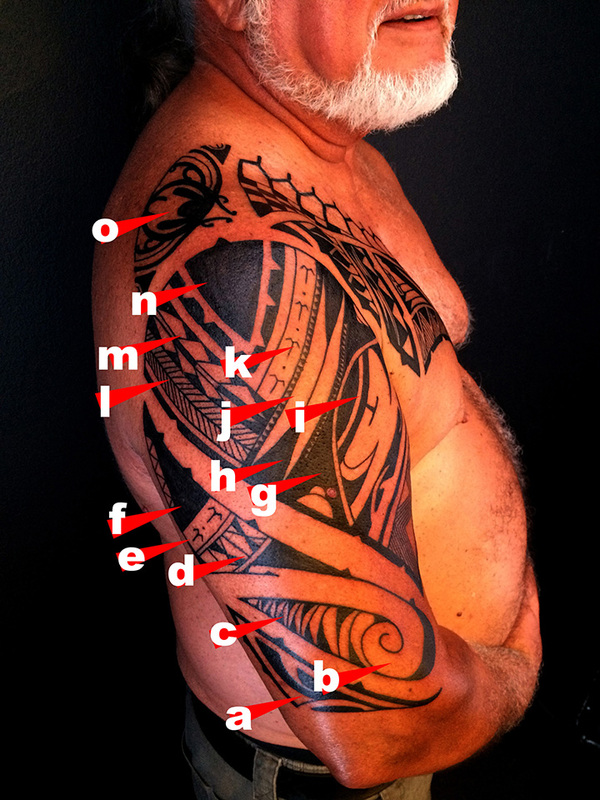 h) Pepehipu: pounded tapa cloth, Marquesan- Worn as armor, covering tattoo underneath. i) Hope vehine: twin goddesses, Marquesan- Very simplified version of motif meant to give life, protect and symbolize creation. j) Enana kaake: troop of warriors going to battle, Marquesan- Sacred connection, common bond, fighting for a common cause (simplified version). k) Hoka: rays of the sun, Marquesan- Courage. Thank you for looking, and aloha!